So in theory, this design is supposed to work with the Thingiverse Customizer, which is basically just a web front-end for OpenSCAD. You get nice little sliders and dialog boxes, and once you have all your information entered, it will render you a custom STL to download. It’s arguably one of the best ideas MakerBot has come up with in regards to how Thingiverse works. Unfortunately, at the time of this writing, Customizer doesn’t seem to work anymore and just gives an error about missing libCGAL.so.10. Sigh. In that case, we’ll need to download the .scad file from the “Thing Files” tab and open it up in OpenSCAD locally. All the configuration values are up at the top of the file and clearly labeled, which makes this fairly easy. Obviously, you’re going to want to adjust the overall box dimension variables at the minimum. But there are also a whole set of options for PCB standoffs (position, diameter, screw size, etc), as well as options related to the built-in vents. Making use of the OpenSCAD import(); function, you can bring in an STL of an existing PCB and see exactly how it will look in the rendered case. As a demonstration, I’ll be making a small enclosure for the Pi Zero, so I’ve imported an STL of it and used that to align the PCB standoffs. But even if you don’t import an STL to use as a guide, there’s a helpful “ghost PCB” that floats around inside the case while your editing the file in OpenSCAD. These options selectively turn on and off the different parts of the model for when it comes time to export the STL. If you don’t turn the other parts off before export, you’ll just get a useless “assembled” STL. Unfortunately, the script is not smart enough to reposition the objects for STL export; so you’ll have to manually flip over the top piece in your slicer, for example. Another annoyance I found is that, even if you turn off the bottom of the case (BShell), the PCB feet still remain. You need to go back up to the script configuration settings and turn them off manually, look for the option called “PCBFeet”. Having worked with OpenSCAD for a while I know why [Heartman] wouldn’t have included rotating the parts on export: it’s a whole lot of code to implement something that the end user can do with a click in their slicer. But making sure the PCB standoffs aren’t rendering when the user is just trying to get the top or side panel is a fairly big omission and would really only take a single conditional statement to fix. Finally, there is some early support for generating customized front and rear panels, including functions to generate openings and labels. But personally, I would suggest just taking the blank panel generated by the OpenSCAD script and importing it into a 3D CAD program your comfortable with. The panel generation code just isn’t ready for prime-time, in my opinion. The design that [Heartman] has come up with for the case is really quite clever, and shouldn’t pose a problem printing. There are no overhangs so support is unnecessary, though you may want to turn off the vents if your printer has issues with stringing, as the thin openings can get clogged up. I printed my case at 0.2 mm layers and 15% infill, though larger cases could probably get away with 0.3 mm layer height for the sake of speed. The design is forgiving in terms of tolerances, and no cleanup was needed after printing to get the parts together. The fit on the front and rear panels is perfect; loose enough that they don’t need to be sanded to git in the channels but tight enough that they don’t rattle around once the lid is screwed down. Incidentally, you must screw the lid down, as the two pieces don’t actually have any interlocking components. A potential improvement to the design would be a way to make the lid snap-fit. 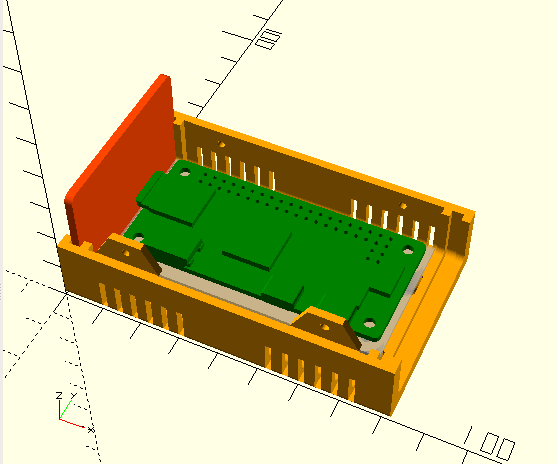 Overall, I think the enclosures generated by the “Ultimate Box Maker” OpenSCAD script are fantastic. They look extremely professional, are very sturdy, and print easily. This is definitely a design I’ll be adding to my regular bag of tricks going forward. I especially like that this is a printable design that clearly addresses a valid need. One-off projects need one-off enclosures, and 3D printing is perfect for that. While we’ve previously covered printed tools that deserve a spot on your bench, the argument could always be made that you’d be better off buying the “real thing”. But I believe this project offers a solution which is actually superior to traditional methods in a number of ways. Thingiverse’s Customizer dropping the ball on this one is especially annoying, as [Heartman] went through the trouble of making sure his design worked with it — there’s some special syntax Thingiverse has you add to OpenSCAD to make their front-end work. Having a web-based tool to generate custom enclosures would be extremely handy, and I wonder if somebody in the community might just take up the challenge of restoring the service MakerBot seems not to maintain? openscad is easy. it’s easier to just make your own enclosure from scratch, especially if it’s as simple as this one. As a person who uses CAD every day for work, OpenScad just blows my mind. I don’t understand how anyone would be willing to use it. Bravo…I guess? Well, if you’ve ever needed to make almost exactly the same part many times, you would understand. Boxes are a perfect example, where you might want everything to be the same – wall thickness, edge radius, ventilation slot patterns – but in a different size. There are CAD programs that make this relatively easy, and I guess you could also write Python or C programs to generate STL files, but OpenSCAD includes all the nice 3D things like intersections and unions. Using OpenSCAD is a little like getting fed up with manually renaming a gazillion files using a GUI file explorer, and instead writing a program to do it for you. Doesn’t pay off if you only have a need for two or three custom boxes, but pays off over time. In my youth I dabbled with POV-Ray. OpenScad uses the same principles, so to me it’s easy to think in only few elements and think about the interections and differences. As a typical hackaday reader, I have one thing to say: A bunch of freaking paragraphs. Very cool. I’d countersink those screws for aesthetics. It’s not a bad place to start and definitely a great effort. I’ve used it a couple of times and have had issues with the tabs that extend to hold the case together printing well (and holding everything tight), so I modded it to use heatset inserts and screws instead of the side tabs. It’s also a great learning tool if you’re just getting started with OpenSCAD (like I am). It’s nice if you want to throw something quick together. I’d prefer my own design though, often with the minimum possible size in mind. I now also have a cnc router which is great for larger boxes. It’s often quicker to mill something out that’s large than to 3D print it. And the option of mixed materials like wood, acrylic and aluminium is also great. I use a parametric solidworks model for milling boxes out on my cnc machine. I almost feel like i should turn around and make one from openSCAD for other people. I think the largest challenge is the work holding and that a single setup on a CNC machine is hard to design, Its not impossible but it creates limitations. I’m not convinced snaping togetherness would be an improvement, it tends to lead to gouging the case to open it and/or not bothering with the screws later on. Nice looking case. I like the two colors as well. In the past I would modify an existing case as opposed to a Hammond enclosure to get a “professional” look, but 3d printing is getting close (I’m talking hobbyist printers). Has anybody had luck using this with http://www.rollapp.com/ ? Customizer is working for me. Are you actually seeing a preview of the STL? You have to scroll down to see the error message. Thingiverse’s customizer hasn’t worked for me for months. However, OpenSCAD does have a version that is capable of customization locally. The most updated build has this disabled as of a few weeks ago, but if you download and install the development snapshot, and enable customizer it will enable you to customize the customizer-enabled files downloaded from thingiverse locally. I’ve not really gotten into 3d printing, but this is the kind of thing that makes me think about getting one, could definitely be useful. Too bad clicking open in customizer does not work. They say it may work if you download and install ope scad and some other piece to it, but they also said the customizer would work. It would be nice if HAD checked this stuff out first. We actually build a web-based configuration tool to generate custom enclosures. While I appreciate people developing things I might have a use for, and make them available free of charge, I’m afraid I can’t use your work because it is poisoned by the restrictive licensing it inherits from Ultimate-Box-Maker. I do understand that people like to get credit for their work, but when they use COMPLETELY free – free as in beer, free as in speech – tools like OpenSCAD, and then put restrictions on their comparatively small investment, they just show how little they understand the concept of Free-and-Open-Source-Software. I’m afraid I’m going to have to develop my own parametric box system, just so there will be a free one available. This isn’t rocket science. I should also point out that th Ultimate-Box-Maker is restricted to NO COMMERCIAL USE, so by not including this in your restrictions, you are violating the Share-Alike terms. Forgetting to include non-commercial was an oversight which I fixed. I thought I used the same license as the original. It is indicated that way in github, as I kept the original license file. I can’t change the license since the original used that license. Is there a way to say my changes aren’t CC so you only have to give credit to Heartman? To be honest, I re-wrote almost every single line of code. It only resembles the original in functionality. I’m no expert on this, but I was thinking about adding some extensions to the Ultimate-Box-Maker myself, and the fact that it had that clause stopped me. I also considered looking at his code and just doing the same thing a slightly different way, but this would be unethical and possibly illegal. I believe that the code for making parametric boxes is simple enough that I can do it myself without looking at any of Heartman’s code, and this would avoid any ethical conflict. Heartman certainly has no claim to the idea of a parametric project box. Since you acknowledge that your design is based on Heartman’s, this binds you to his restrictions. That’s my opinion. Now, if there’s really very little of his code left, and that code of his is not particularly unique or clever (i.e., it’s just what would be the obvious thing to do based on OpenSCAD’s capabilities), then it might be that what he makes claim to is just his own implementation, so it might be sufficient to purge your code of any vestiges of his, and then remove the “derived from” notice, but I think that would just invite a conflict. I’m not sure why so many commenters are so concerned that Thingverse’s customizer doesn’t work. Have we become so dumbed-down by the AGUI (Almighty Graphical User Interface) that we are too frightened to change values at the top of a text file? It’s not like you need to see the box change as you drag a slider – if you need a box for a particular purpose, you type in the dimensions, whether it’s in a GUI wizard or at the top of a text file. What’s the big deal? I mean, how is it easier to type a number into a box labeled “Length” than it is to change the number in a line of text that says “Length = 160;”???? Oh, I see, you don’t want to be making changes to the master file. Well, there was an ancient trick used back in the age of dinosaurs and command lines: you make a copy of the master file, and edit THAT. Once you figure out that “//” means that everything from that to the end of the line is instructions or clarification for the user, rather than code, it’s hard to imagine anyone able to operate a 3D printer, who can’t figure out how to change the parameters in OpenSCAD’s editor.